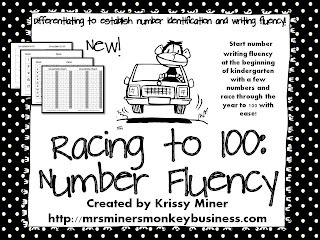 I started number writing fluency charts with my students last year closer to the end of the year with amazing results. After introducing teen numbers this year and then the twenties, I saw so many confusions...backwards numbers, incorrectly formed numbers, numbers reversed and even upside down! I knew that it was time for an intervention on number fluency, but I also knew that the majority of my class wasn't ready for a blank 100s chart either! So, I created booklets for them to start at their own level and increase as they are ready...it has only been a week and my students rapid number identification, number writing fluency and number sense has increased SIGNIFICANTLY! I can't say for sure what the reason behind it is, but this process works like a charm...it is a no pressure, no risk involved procedure that my students are LOVING. I gave all of my students a blank 20s chart, along with a completed chart to create my baseline (copied on legal sized paper vertically, but could be arranged in any way that works for you). First, I asked if anyone wanted the challenge of writing the numbers absolutely perfect without peeking at the number chart and then I simply fold the number chart back. Then I monitor all of the children and decide which book they will get based on my observations. Many bumped up to the Race to 50 book, but most started at the Race to 20 book. Even though they could write the numbers to 20, they need to be able to do it quickly and without the use of the numbers chart. The students are so motivated to bump up books, but yet don't look at it as a competition with anyone but themself. All of the books look essentially the same, so none of the children are really aware what "level" their peers are working at. I have already sent 3 kindergarten students to the principal because they have written their numbers to 100 perfectly and fluently (any ideas where I can go next with these smarties??) and will be sending a few more this week. Most students have graduated into the race to 50 booklet and, let's face it, once they get the pattern up to 50, going to 100 is nothing! You can check out my freebie for Race to 100 here or, if you are interested in a more differentiated approach for your class, you can get more information about the kit that will help you with this by clicking on the picture below. I will post pictures of my students' amazing progress as soon as I remember to take the pictures! Promise! I assume you do oral skip counting by 2's, 5's, 10's, etc. How about having the children begin to fluently write the numbers, and then, even have them skip count by other increments to get them thinking for multiplication down the road? Just a thought! Can they write from a given number? Say if you told them to write only from 59 to 72? Have them write them to 200! Have them write 10's to 100 or 5's or even 2's. That is amazing! You could now give them the challenge of starting at a given number, have them write numbers counting by 10's or use their 100's chart to begin to see the patterns of 10's (even though this is not a common core standard in kindergarten). A common core standard in first grade is to represent data using tallies. You could give students a number and have them represent it with tallies. So many things you could do! Is the race to 20 book a freebie also? Since most of mine have mastered the 100 chart as well I've moved on to filling in just the 5s. We began by learning the song "Count By 5s" from Ron Brown the week before we started. So they were very successful at their first attempt! Then I had them fill in the rest of the chart around those numbers...a challenge as well since they had to "skip" those 5s! Once they master that I'll move on to the 2s. Good luck and I hope my idea works for you! This is great! Those backwards and mixed up numbers are one of the things that drive me so crazy about kindergarten. For your "smarties", you could start doing math facts (like addition) and see how many they can get in 2 minutes. Since they are already great at writing their numbers why don't you have them develop a project with their new skills like maybe creating a number dot-to-dot for others to try? Maybe it could be made into a dot-to-dot book for the whole class? I would push those kiddos who can write to 100 and have them write to 120. THen I would have them practice filling in a missing number grid, then maybe give them blank number grid to 120 and have them fill it in but not going from 1-120 in sequential order...see if they can get the pattern going down in each row, or see what else they can do. They I would have them start to represent a given number....start easier and then give them harder ones. I think number writing is important as far as in the right order and making sure no numbers are backwards and what not, but representing numbers in a harder concept and would challenge them. You could do this in so many ways, the possibilities are endless. Hi, Nice informative blog post for kids. I like to practice some from your post with my school kids. Thanks for posting such good one.